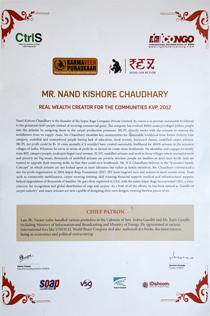 We take immense pleasure in announcing the receipt of KARMAVEER AWARD bestowed upon Mr. N.K Chaudhary as Real Wealth Creator for the communities KVP, 2012.The Company founded by Mr. Chaudhary has evolved 40000 underprivileged jobless people into the artisans by assigning them to the carpet production process. As a fruit of all efforts, he has been named as “Gandhi of carpet industry” and many artisans are now capable of designing their own designs, weaving flawless pieces of art. 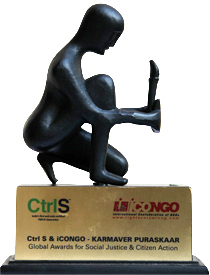 Now into its fifth year, the KARMAVEER PURASKAAR is a highly coveted award and is given only to Individual Citizens (Individual social responsibility is vital for us) from different sectors The "KARMAVEER PURASKAAR (KVP)" is the Global Awards for Social Justice and Citizen Action instituted by the people sector with various partner organizations, citizens at large and media supporters. The awards are a part of the RIGHT every WRONG movement. The awards are given every year on the 26th day of November, our National Social Justice and Citizen Action Day, the day we adopted our constitutional pledge as a REPUBLIC and Indian Citizens in 1949 he people sector instituted these awards based on a simple passion mantra- to recognize real life unsung heroes who believe 'It is better to light a candle than to curse the darkness' and have walked that extra mile to "Be the change they want to see in this world". KARMAVEER awardees are dubbed by the people as NOBLE LAUREATES.